With technology getting advanced every day, it is needless to say that the time has arrived to move on from keys to automated digital locks. A smart or digital lock is an electronic mechanical locking system that can open all locks wirelessly and keyless. It is much safer than traditional locks, and requires user’s authentication before opening. These locks provide access to the home owners without the traditional key use and allow them to open or lock their homes through smart phones and sensors. Other than this fingerprint locks are also available, so that you don’t need to hassle with all those groceries in your hand. 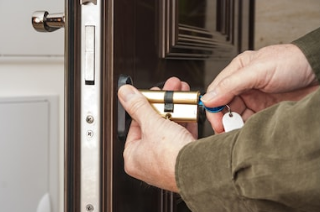 These locks can be availed in White Plains locksmiths and they provide utmost security and convenience and they have various types of locks for you to choose from. It can be often confusing what locks do you want to choose for your house. So there are certain points that you need to keep in mind before buying the smart locks. Some of the major features that you must keep in mind before buying a smart lock from White Plains Locksmiths are as follows. While buying an auto lock from the locksmith near me, make sure you check its battery life. You will find that these locks are powered by AA batteries. You can also find few of them with rechargeable lithium ion cells. In both cases, an alert on your app will pop up when your battery gets low, and often, the indoor housing unit will include an LED that will flash red when batteries need to be replaced. Battery life is also rated by some companies in terms of the number of physical locks and unlocks (cycles), and power lasts anywhere from three months to a year, depending upon lock type and function. Most Bluetooth-enabled locks provide keyless/code-less entry. Smart locks, especially retro locks, allow you to auto-unlock your door when you have your smart phone in person and you are within a user-prescribed distance. Smart locks with keypads usually do not include proximity auto-unlock features for security reasons. Often-unpredictable Bluetooth or Wi-Fi options cannot always be reliable. Apart from wireless unlocking techniques, more realistically-designed smart locks offer alternative entry options, such as PIN codes or physical keys. A limited number of smart lock brands give you a key fob to wirelessly unlock doors when you do not have your smart phone with you. Complete replacement smart locks from locksmith near me indicate their temperature-withstanding levels, along with an IP water/dust-proof rating. All locks cannot resist adverse weather conditions over the years, thus it is ideal to buy from manufacturers who use sturdy material with a solid weatherproof rating. The locks containing guest key models allow you to assign ‘keys’ to visitors you approve of – friends, family members etc. You text or email a code via the smart lock app that grants your visitors the ability to enter for a stipulated amount and number of times. Replacement smart locks with keypads allow you to simply assign temporary PIN codes for single use, or a specific amount of time. So whenever you are buying these locks from White Plains locksmith make sure you keep this in mind, and for all other locksmith needs , get in touch with us at anytime of the day.